Although the biggest night market in Taipei is located at Shi Lin, the majority of the tour guides and locals I met highly suggest that I visit Raohe Street Night Market instead. It’s more of the night market of the locals where they drop by after a busy day. 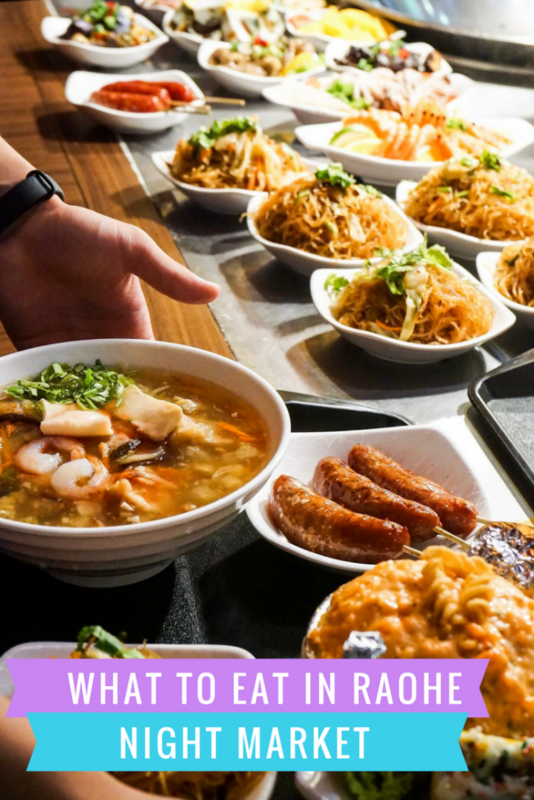 So, Lara and I explored Raohe Street Night Market to get a sneak peek of a nightlife in Taiwan and of the Taiwanese food culture through the night market. When visiting Taipei, you should definitely add this Raohe Street Night Market in your itinerary. It is only one of the many night markets in Taiwan that started only as a small gathering of the locals near their Temple plazas. The food stalls in the small gathering were then joined by retailers selling garments, accessories, herbal medicines, and so on. I think one of the reasons that many people prefer Raohe Street Night Market is because it is only at a walking distance from the Taipei Mass Rapid Transit (MRT) – Songshan Station, making it convenient to reach the night market. Moreover, the MRT of Taiwan has a fair reputation for being clean, spacious, and easy to navigate. By using cash or Easycard, you can buy a ticket at any MRT station for the Green Line. The Green Line pertain to route from Xindian to Songshan and vice versa. One-way Ticket may cost around NT$ 20 to NT$ 65 (P 34.13 to P 110.91). For NT$ 150 (P 255.95), one-day pass ticket can be purchased which will allow you to take unlimited ride at any route for one whole day. When you alight at the Songshan Station, you may take Exit 5. In the north of the Songshan Station, you can see the Chinese Temple, the Songshan Ciyou Temple, which can be more stunning when its night lights are lit up. On the left of the incredibly beautiful temple, you’ll be greeted by the archway of the Raohe Street Night Market. Riding a metered-taxi to go to Raohe Street Night Market is also convenient. The fare rate starts at NT$ 70 (P 119.44) for the first 1.25km and NT$ 5 (P 8.53) for the next 200m. If you’re still having doubts about taking public transportation, you may purchase this kkday product which offers an option to include the Raohe Street Night Market as an itinerary. You’ll no longer need to worry which public transportation to take. The vehicles for rent depends on the number of travelers. 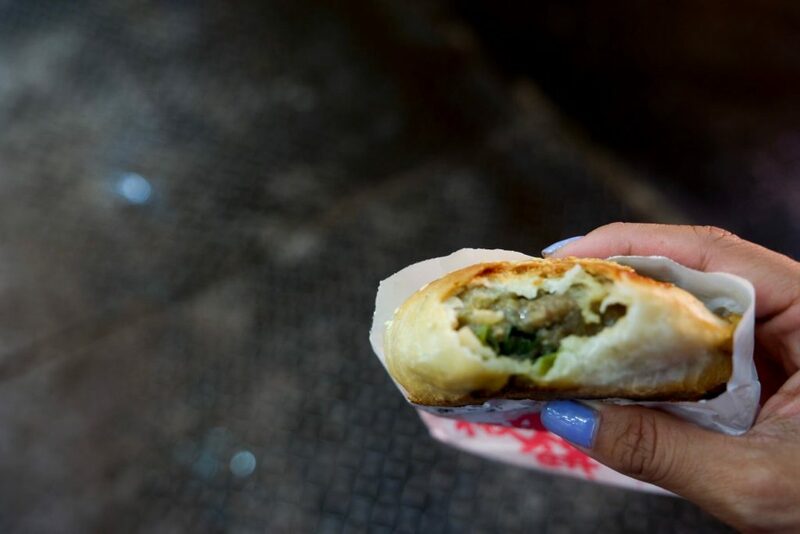 It is best to come here early in order for you not to be overwhelmed by a huge crowd and for you to get ahead in line especially when ordering the famous Pepper Pork Bun. But if your schedule does not permit you to be early at Raohe Street, it is okay since the night market is open from 5 PM until 11 or 12 midnight. Taiwan is one of the major suppliers of mushroom in the Philippines. The mushroom farms are mostly located in Taichung area which has the right weather to grow any kind of mushrooms. 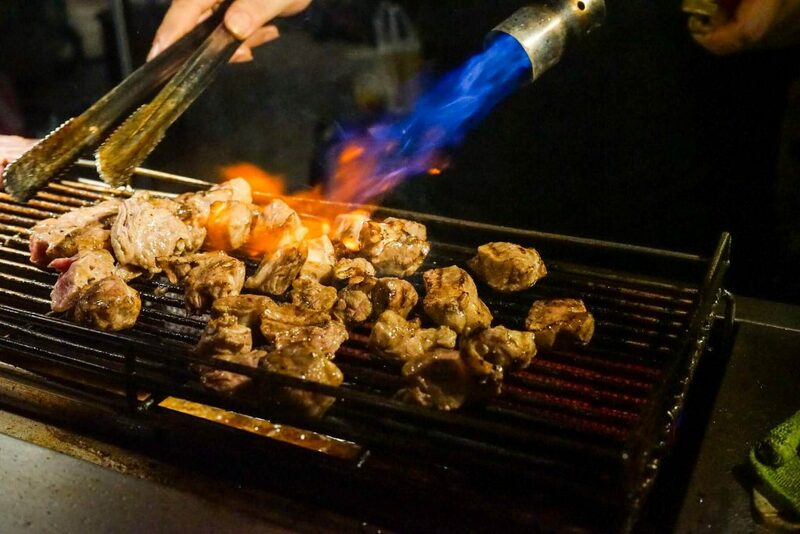 In Raohe Street Night Market, you can find a number of stalls selling grilled mushrooms. They serve grilled and chopped king oyster mushroom drizzled with Lemon Pepper Sauce for about NT$100 (P 170.63). My friend and I both liked this fresh and light mushroom a lot. This simply prepared street food is a sure must eat in Raohe Street Night Market especially for vegetarians. Taiwan has an abundant source of fresh seafood. This is evident as you stroll in any Taiwan Night Market like in Raohe Street. 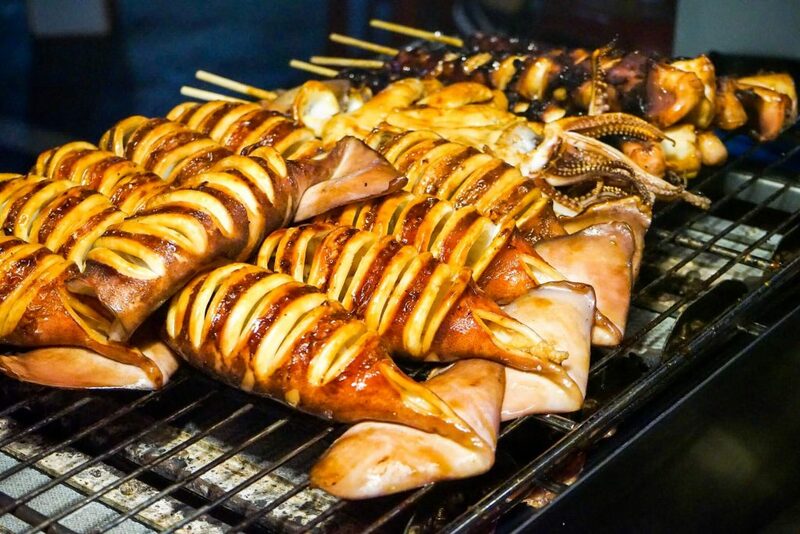 One of the seafood sold in stalls at the Raohe Street Night Market is grilled squids. The good smell coming out of these stalls is really inviting. 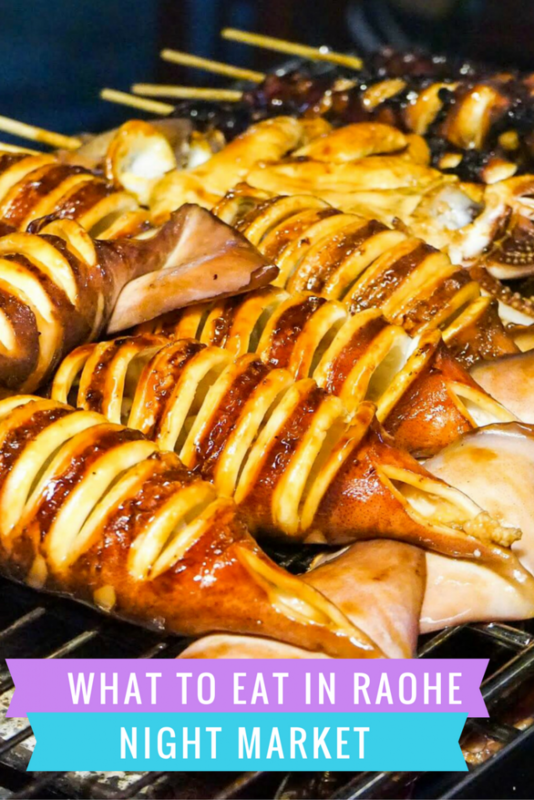 Squids are grilled in a flattened form, or in its original tubular form. Either way, you can see the squid is perfectly cooked. It has no breadcrumbs coatings but is brushed with their signature sauce and sprinkled with chili powder. People love Wagyu Beef because it is succulent, good quality meat and contains unsaturated fat. It is good for the health. This first caught our attention because of how they torch the beef, of course, we ordered the Wagyu Beef with rose salt and cumin for NT$ 200 (P 341.26). Lara and I loved this the most. We almost always craved for it. It was surreal. It is well-seasoned and succulent. It is one of the best steaks we’ve had and it’s so cheap for a high-quality meat! I’d eat this over a very expensive steak place in a fancy restaurant. This was tender and juicy and so good. MUST MUST MUST TRY! Bubble Milk Tea is sold at almost everywhere in Taiwan. That’s because Taiwan is the birthplace of the Bubble Milk Tea or Pearl Milk Tea. In Taiwan, Tapioca is sometimes referred to as “frog’s egg.” So, when in Roahe St. Night Market, you can notice some stalls with a drawing of a frog on their signages. Other stalls, you may notice, serve only milk tea without pearls, fresh fruits mixed with teas and fresh fruit juice. Another blockbuster stall which can be found in the middle of Raohe St. Night Market sells an authentic Chinese dim sum, Xiao Long Bao. While you’re in line, you can watch the food servers meticulously prepare the dim sum. One order of this delicious bite-sized and steamed dim sum cost NT$ 40 (P 68.25). 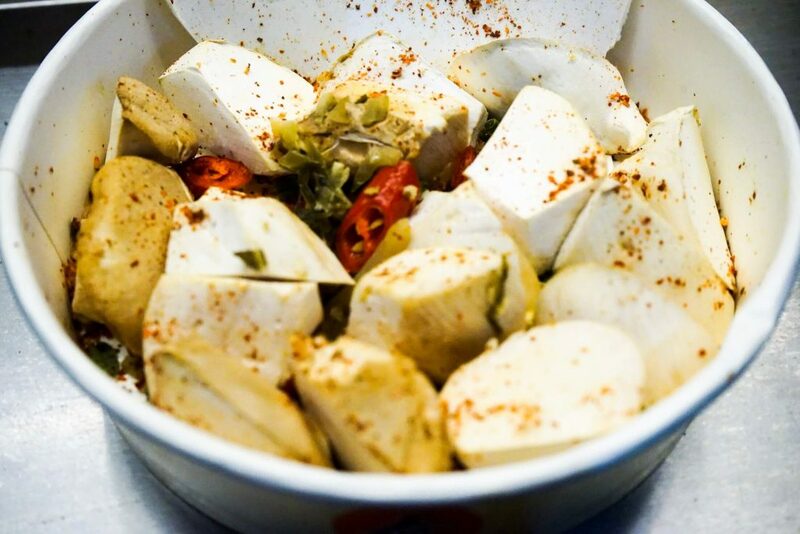 Your nose will surely know where to find the Stinky Tofu stall. 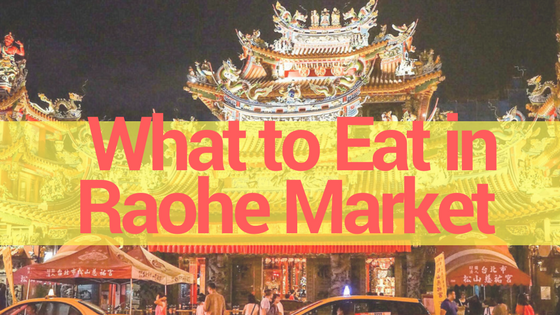 Despite its unappetizing smell, it still often gets into the list of the top must eat in Raohe Street Night Market by locals and tourists. Once you take the first bite and the next bites, you’ll probably forget its unpleasant smell. It can be really surprisingly delicious. It comes with pickled cabbage and chili sauce that complements the spongy texture and a little crispy outside of the tofu. Anyway, the toasted white round bread with mixed pork and green onion filling is baked in a Chinese Style Tandoor oven. Even judging only by how it is prepared, how it looks like, and how it smells, it is already inviting. It comes cheap too at NT$ 50 (P 85.35). 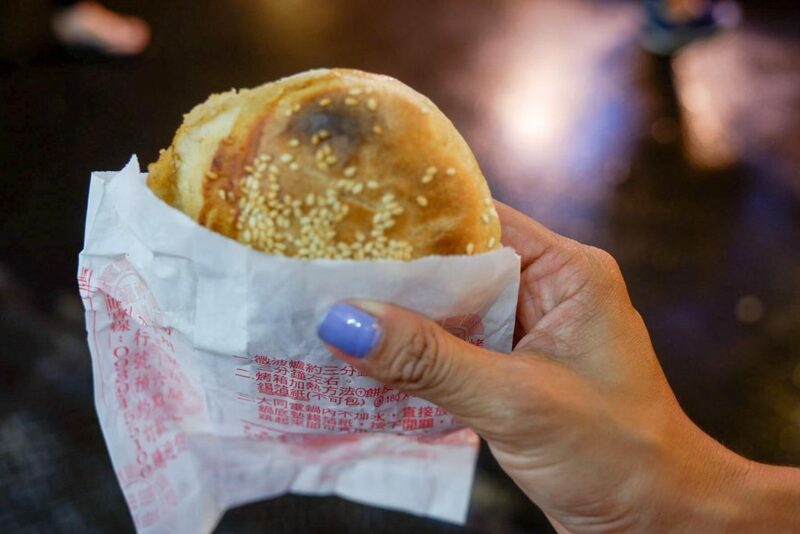 So, don’t forget that getting in queue for this freshly baked bun should be the first thing you need to do when you get to Raohe Street Night Market. If you are more into fried over steamed food, you can try another stall which sells fried dumplings for more or less NT$ 50 (P 85.35). This is served with fresh red chili and a hint of sweet and salty sauce. Lamb and Pork Rib Soups are definitely a must eat in Raohe Street Night Market. Stalls selling these are those with tents and sauces. We loved it a lot. I liked the lamb but mostly ate the pork. Lamb and Pork Rib Soup is, by the way, a medicinal soup. So, you would notice hat the bone doesn’t have much meat left. But, the meat flavor is already infused in the herbal soup. Stalls selling these medicinal soup also serve rice with braised pork topping. The Pork soup and rice cost NT$ 85 (P 145.04). For the lamb, it cost NT$ 80 (P 136.50). This was another of my super fave! Grilling Corn and brushing them with a special spicy sauce seems unique and quite different. 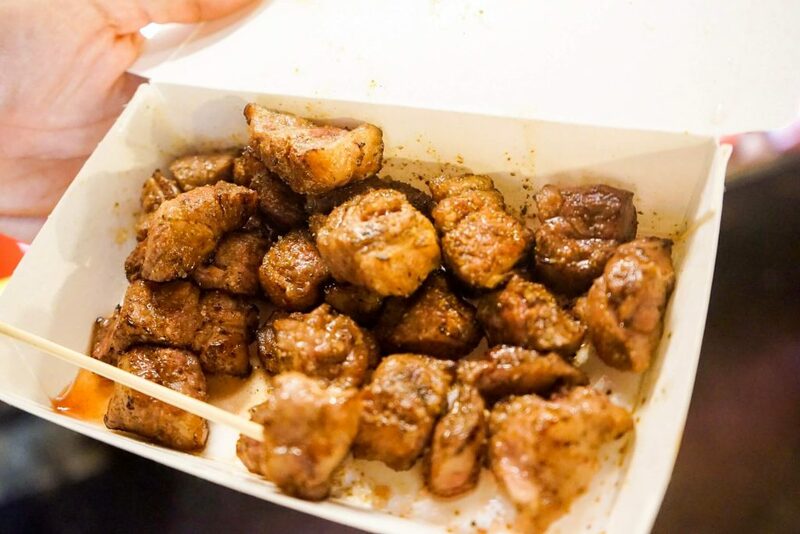 But, it is one of the usual street foods in Taiwan’s night markets. 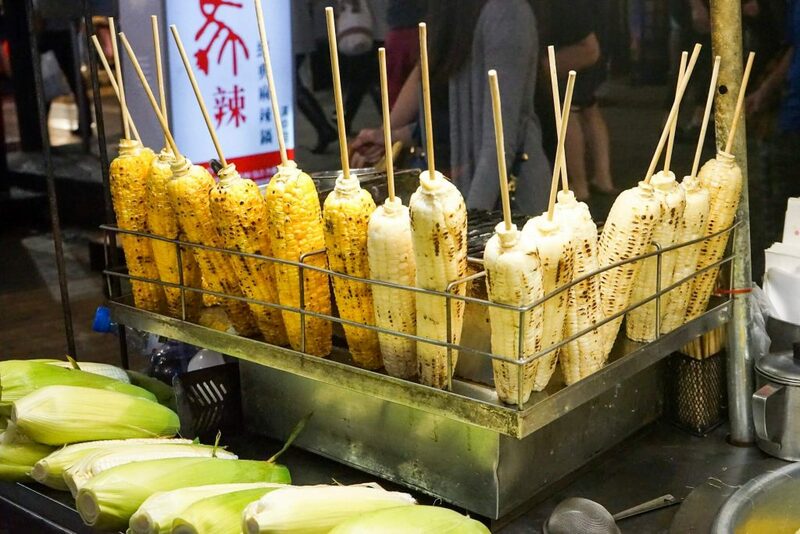 The way they prepare the corn and their grilling device caught my attention. My friend Lara didn’t really fancy it. But for me, it was good and worth the NT$ 75 (P 127.97). In Taiwan Night Markets, Oysters are served into an omelet or a mee sua soup. But, many prefer having it simply seasoned with salt and cooked through the grill fire. 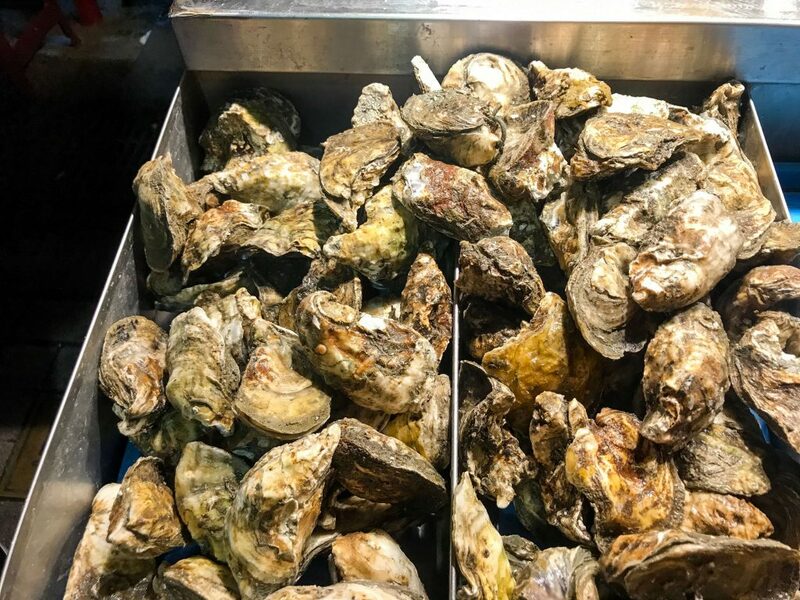 With NT$ 100 (P 170.63), you can already order 5 fresh grilled oysters. 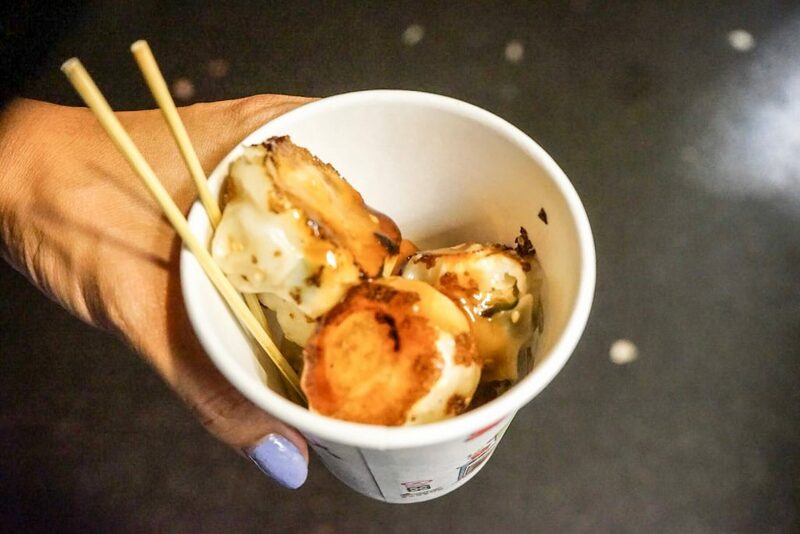 So, that’s our list of must eat in Roahe Street Night Market. There are other fancy street foods to try in this night market like candied strawberries, red and green bean jellies, and sweet egg tarts. We wanted to try them but then we were too full at that point. One more thing we tried but we didn’t really like is the grilled octopus with cheese. It looked like takoyaki. We partnered it with the famous otaka sauce and the Japanese nori but it felt bland or a bit lacking in taste. Aside from a wide range of local and unique food choices, the Raohe Street also serves as a place to pamper yourself, as a shopping center, and as a playground. Here, you can play mahjong, arcades, and other carnival-like games. You can shop your clothes, accessories, and souvenirs. You can even find a salon in the area. Raohe Street Night Market truly remains as a gathering for locals and tourists.